We’re already past the first round of the USCL playoffs, but as I haven’t written about any of our prior matches, I’ll have to fill in the back-story over the next few weeks. In the meantime, SF has advanced to the Semifinals! Like in 2011, we were facing the LA Vibe, but unlike that year, we had draw odds in the match by virtue of winning the Pacific Division pretty handily. Our lineup was youth heavy with me as the elder statesman (!) on board 1 followed by GM Daniel Naroditsky, FM Yian Liou, and Siddharth Banik. 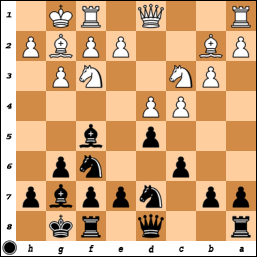 On Board 1, I had the black pieces versus GM Melik Khachiyan (follow link to play through the whole game). 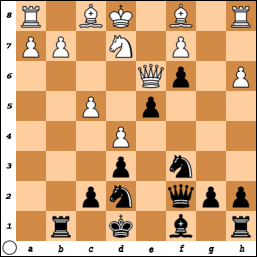 Melik and I have played a few times before, and in both games with the black pieces, I chose 1…e5 (one Ruy Lopez Exchange that was drawn and one Italian Game that I won). This time around though, I decided to mix it up with the French and even more so, with the 12…d4 version of the Winawer Poison Pawn. 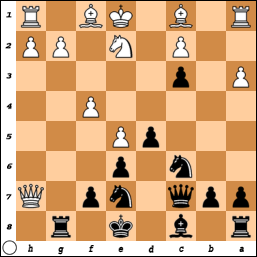 While I’ve long played the French against 1.e4, I didn’t start out playing the Winawer and this actually marks the 4th time that I’ve played the Poisoned Pawn Variation. I started with the 3.Nc3 Nf6 lines, switching over to mostly the Winawer starting in the mid-2000s. 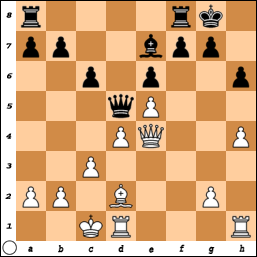 But after becoming a GM, I went back to 1…e5 (which I played before the French), albeit with the Lopez instead of the Petroff or other lines. All this is to say that when another annotator writes something like, “Vinay Bhat is a French, in particular, a Poisoned Pawn devotee” (when annotating 1 of the now 4 Poison Pawn games I’ve played), take it with a grain of salt. Your blogger-in-hiding hopes to make a return over the next few weeks, partly to write about the upcoming Anand – Carlsen match, but also because I’ve been playing a few games again in the US Chess League! I heard about this video from Dennis Monokroussos’s blog (The Chess Mind) and the stretch he refers to in that entry is pretty amazing to watch. Start around 8 minutes in and you’ll see Karpov fidgeting a bit, but pretty calmly resigning and losing the Championship Match in 1987. I’ve definitely reacted worse to some losses, but maybe given the adjournment break and some time to consider the sizable audience watching, I might have not completely embarrassed myself in his shoes. But not only does Karpov shake hands and sign the scoresheets, he calmly puts his pen in his jacket pocket and starts analyzing the endgame with Kasparov! Gelfand’s no slouch in the upstanding-citizen department, but when he lost to Anand in the Championship tiebreaks last year, he shook hands, said a few words of congratulations, and then got up and left. No hanging around to figure out where he might have gone wrong or to look at some alternatives. Pretty normal if you ask me, but Karpov reacts like he’s just lost a casual weekend game.